It’s time for some education by JFTB. 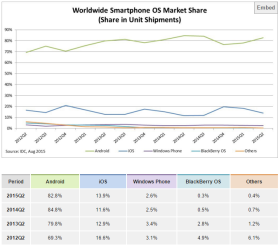 As you can see on this graph, the most recent mobile OS market share report by IDC shows that Android has a market share of 82%. (Source: idc.com) These are absolute fantastic numbers! But they are also vastly misleading, and today I will explain why. As I wrote about in this article, Android is an semi-open OS that can be installed on almost any device you want. While iOS is a hardware specific OS and only runs on Apple devices. The reason that Android is so flexible is also the cause of these inflated market share numbers. Because Android is capable of being installed on almost any device at a very low cost or even none at all, we see a huge selection of Android capable hardware on the market. This also means that there’s a massive amount of low end, china produced, absolute crap devices which is hardly usable, that runs Android. If we look at the mobile device market share based on brand, we can clearly see that Samsung with 21,4% market share, is the leading brand. 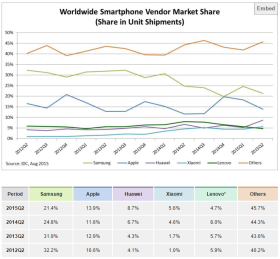 Apple takes a 2nd place with 13,9% market share. (Source idc.com) Samsung as a vendor has a huge lineup of models, ranging from $65 low end devices that are barley passable as a “smart phone”, all the way up to $900 high end desktop class performing devices. We have to keep in mind that all the low end devices are included in the market share statistics. When we compare this lineup of models to what Apple offers, Apple only keep 3 models to choose from in their lineup, and all of them could be considered as high end, as they do not have any low performing budget alternative like Samsung and many other brands have. So how do we make this comparison fair? Well, we could take a look at what are the top 10 most popular and most used Android devices, regardless of brand? I made it fair and included all Android devices that has 1% or more in market share, and ended up with a top-15 list of devices, which can be seen here. 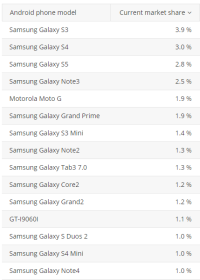 (source: appbrain.com) As you can see, the list is dominated by Samsung devices, but even Motorola has a 1,9% market share among the top-15 most popular Android devices. If we sum this up, the actual Android market share of usable devices with up-to-date hardware is 26,5%. By now I am sure you understand that the initial number of 82% Android market share is vastly inflated by insignificant and useless budget devices. I mean today you can buy a $24 china manufactured no-name tablet that runs Android, but how usable is it?